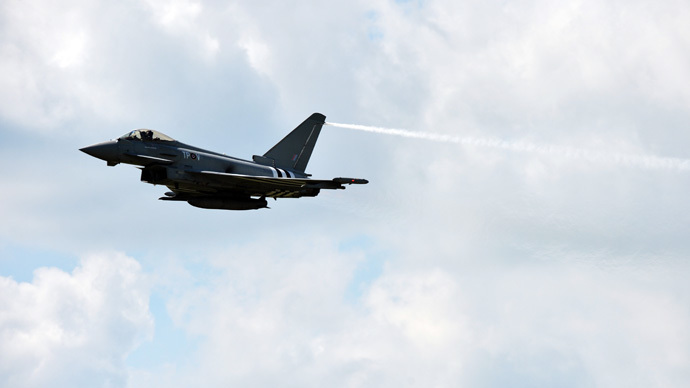 Royal Air Force Typhoon jets could be involved in a mid-air crash with passenger airliners because the fighter jets have not been fitted with a collision avoidance system, the RAF’s chief has warned. An annual report from the Military Activation Authority (MMA) said a collision between a Typhoon and a commercial jet was “improbable,” but could cause a “substantial” loss of life. “Collision avoidance systems should be installed with full haste,” it said. The Ministry of Defense said it was considering the installation of the potentially lifesaving equipment to its Typhoon fleet. Air Chief Marshal Sir Andrew Pulford warned Defense Secretary Michael Fallon of the “dangers” posed by the Eurofighter Typhoon, which has not been fitted with an airborne collision warning system. Last year, an inquiry reported that the lack of a collision warning system on two military aircraft, which collided over the Moray Firth in 2012, directly contributed to the crash. Three airmen died in the incident. Responding to the report, an MoD spokesperson confirmed “a collision avoidance system is being fitted to the Tornado GR4,” the type of aircraft involved in the 2012 crash. The spokesperson also said “planned upgrades” were proposed for the new F35 fleet. “Air safety is at the core of all our aviation activity and we take very seriously our obligations to our people and the wider community to ensure that our activities are both as safe as reasonably practicable and comply with relevant policy and legislation,” the spokesperson said. Scottish National Party (SNP) spokesman Angus Robertson MP, whose constituency hosts RAF Lossiemouth, said the MAA's report was “hugely damning” for the MoD. “Twenty years after it was proven and recommended that these systems would save lives they remain to this day uninstalled,” he added.